Our awards - PRPUE Automated tourism technologies - official website. All the health resorts, recreation centers, exkursion and hotels of Belarus. 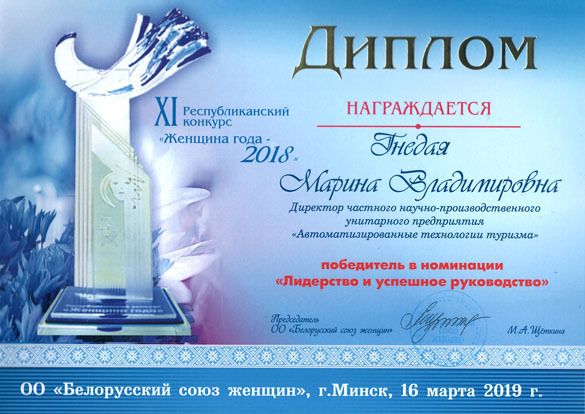 the winner of XI Republican contest "Woman of the Year 2018"
Award ceremony for winners in 5 nominations of the contest "Woman of the Year - 2018" took place in Minsk on March 16, 2019. Director of PRPUE "Automated tourism technologies" Marina Gnedaya became Winner in the nomination "Successful Leadership". This nomination is awarded to successful women in business who have made a significant contribution to the development of women's personal and professional potential, the development of the women's movement in the region, and also created favorable working conditions in their field of activity. Marina Gnedaya thanked "Belarusian Women Union", all its participants and organizers of the contest for the high appreciation of her work. Award ceremony for winners in 5 nominations of the contest "Woman of the Year - 2018" took place in Minsk on March 7, 2019. 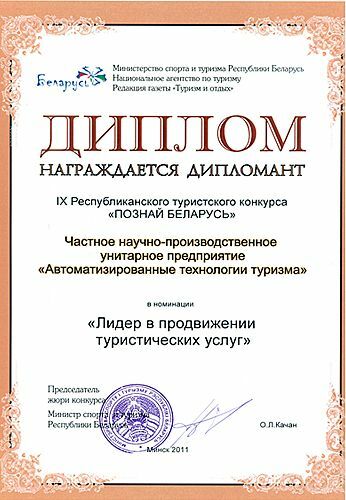 By the Decree of the President of the Republic of Belarus A.G. Lukashenko №222 of June 23, 2017 private research and production unitary enterprise "Automated Tourism Technologies" is listed on the Republican Honor Board. For the first time since the opening of the honor board in 1999, such a high award was awarded to a private tourist enterprise. The grand opening of the renovated Republican Board of Honor was held on the eve of Independence Day on June 29, 2017 on the National Flag Square in Minsk. We thank the Head of State, the Government, the Ministry of Sport and Tourism and the Minsk City Executive Committee for appreciating the results of our work. 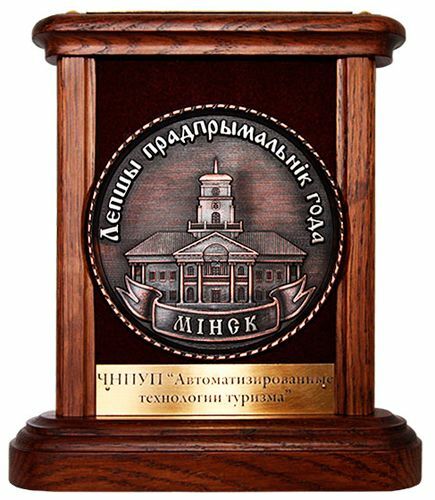 April 25, 2014 in the contest "Best Entrepreneur of the Year in Minsk - 2013" it was the award ceremony. PRPUE "Automated tourism technologies" for the fifth time became the winner in the nomination "Best Entrepreneur of Minsk in tourism and hotel service". Thank to Minsk City Council and the Mayor of Minsk Nikolai Alexandrovich Ladutko, Minsk city Council for Enterprise Development, the Ministry of Economy for the appreciation of our business. 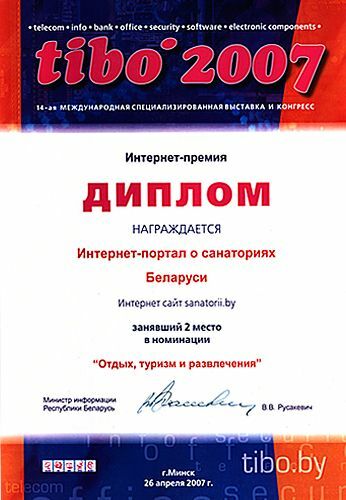 December 30, 2013 on the results of the Republican contest "Best Entrepreneur of the Year of the Republic of Belarus" for the year 2012 held a ceremony awarding the winners and laureates. 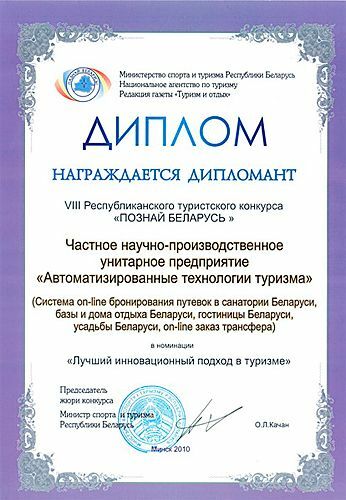 PRPUE "Automated tourism technologies" became the winner in the nomination "Best Entrepreneur of the Republic of Belarus in the sphere of tourism and hotel service". Competition "Best Entrepreneur of the Year" - Republican event aimed at increasing the professionalism and goodwill of business structures. Awards were given to the best entrepreneurs for achieving high performance in financial and economic activity of the country. 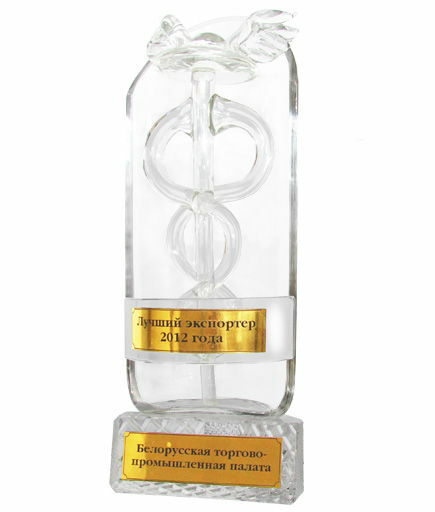 September 19, 2012 on the results of the Republican contest "Best Entrepreneur of the Year of the Republic of Belarus" for the year 2011 was held a ceremony awarding the winners and laureates. 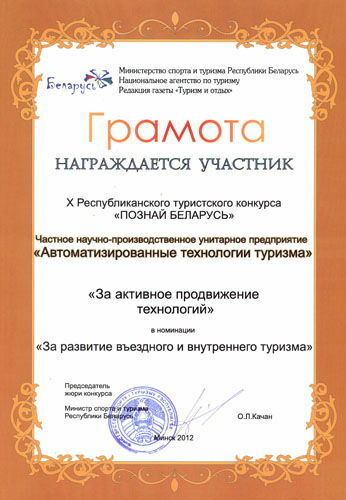 PRPUE "Automated tourism technologies" became winner in the category "Best Entrepreneur of Belarus of the Year 2011". 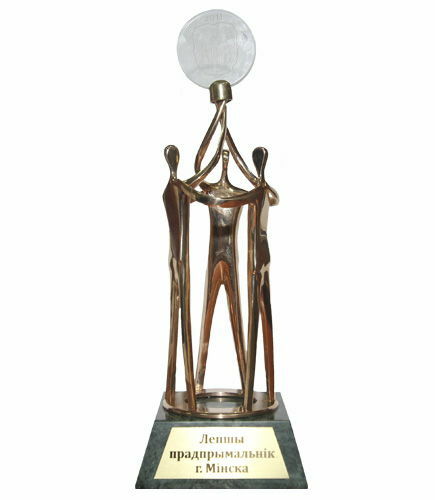 Competition "Best Entrepreneur of Belarus of the Year " - Republican event aimed at increasing the professionalism and goodwill of business structures. Awards were given to the best entrepreneurs for achieving high performance in financial and economic activity of the country. May 22, 2013 on the results of the republican competition "Best Exporter 2012" held awards ceremony and winners. 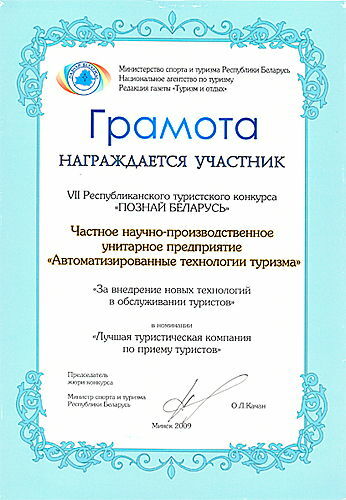 PRPUE "Automated tourism technologies" became winner in the category "Organization of small entrepreneurship". Competition "Best Exporter of the Year" - nationwide competition, aimed at identifying and encourage businesses and entrepreneurs who have reached the highest rates on export overseas markets in the industry, stimulating the development of export-oriented production, increase the prestige of Belarusian producers of goods and services in the global market. 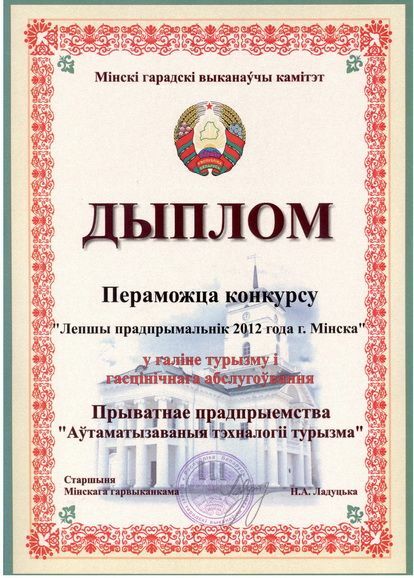 Best Entrepreneur of Minsk in 2012 in the sphere of tourism and hospitality services. 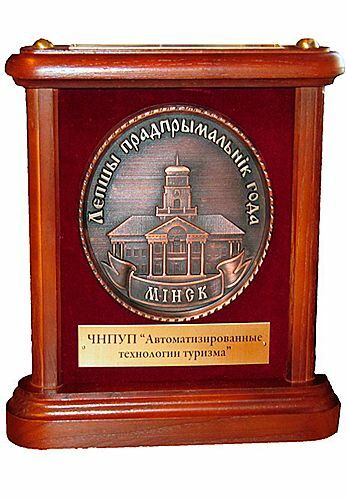 March 29, 2013 in the contest "Best Entrepreneur of the Year in Minsk" for the year 2012 the award ceremony. PRPUE "Automated tourism technologies" became the winner in the nomination "Best Entrepreneur of Minsk in tourism and hotel service". Competition "Best Entrepreneur of the Year" - Republican event aimed at increasing the professionalism and goodwill of business structures. The contest can be seen not only as stimulating business activity - it is also more opportunity to attract the attention of the consumer, the victory in such competitions - a sign of quality. 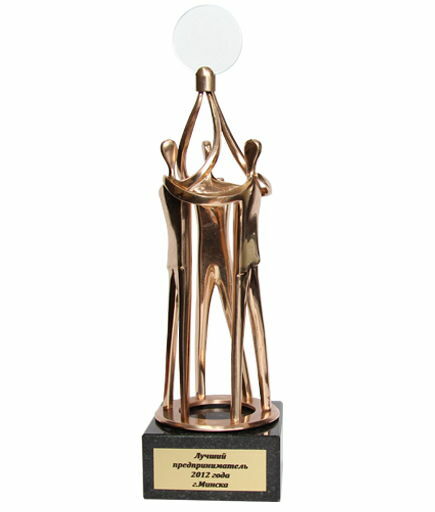 April 6, 2012 in the contest "Best Entrepreneur of the Year in Minsk" in 2011 it was the award ceremony. 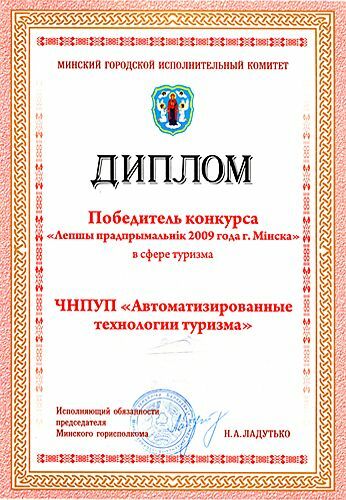 PRPUE "Automated tourism technologies" for the third time became the winner in the nomination "Best Entrepreneur of Minsk in the tourism sector". The contest "Best Entrepreneur of the Year" - Republican event aimed at increasing the professionalism and goodwill of business structures. The contest can be seen not only as stimulating business activity - it is also more opportunity to attract the attention of the consumer, the victory in such competitions - a sign of quality. 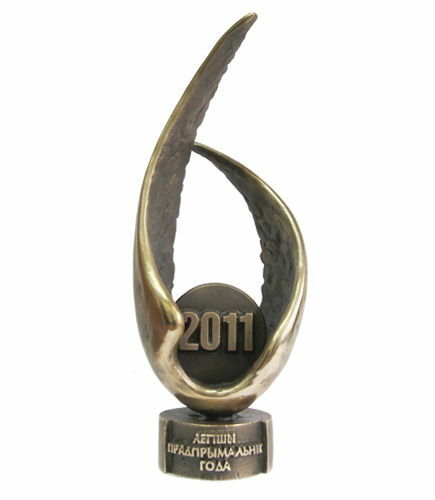 March 25, 2011 on the basis of competition "Best Entrepreneur of the Year in Minsk in 2010 the official award ceremony was held. 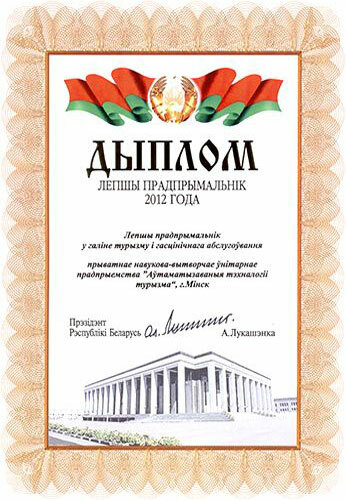 July 23, 2010 the solemn ceremony of awarding the winners and laureates of the results of the Republican contest "Best Entrepreneur of the Year" for 2009 with the participation of Prime Minister of Belarus Sergei Sidorsky. The contest "Best Entrepreneur of the Year" - an event aimed at raising professionalism and reputation of business structures, creating a positive image entrepreneur, encouraging business activity in order to solve problems socio-economic development of the country. The competition involved the legal entities and individual entrepreneurs - and winners winners of regional and Minsk city competition for the best entrepreneur in the reporting period. At competition attracted more than 940 business entities. The competition was held in 16 nominations. Organization and carrying out of the republican competition conducted by the organizing committee, the personal composition which is approved by the President of the Republic of Belarus. The organizing committee examines the documents of participants received from the regions (Minsk), and specifies for each category of the competition, as a rule, no more than three participants with the best financial and economic activity, and to the President of the Republic of Belarus the aforementioned documents to determine the winners of the Republican contest. The winners and laureates of the Republican contest determined by the President of the Republic of Belarus. Decisions on the winners of the contest are issued by Presidential Decree. 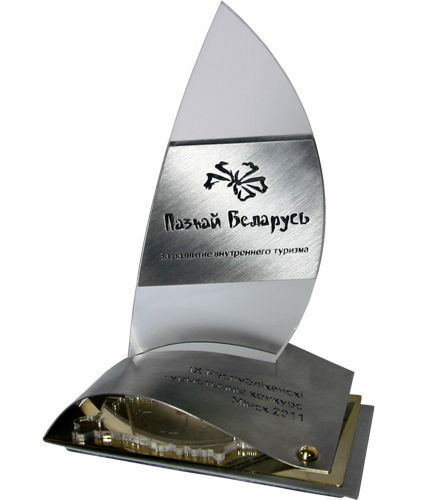 March 26, 2010 held a ceremony awarding the winners of the contest "The best entrepreneur of the year in Minsk" in 2009 . The organizing committee of the competition consists of representatives of the Minsk City Executive Committee, the Council for Development Entrepreneurship in Minsk, representatives of various public organizations. Annually assessing achievements in production and business activities of various enterprises the capital, Minsk City Executive Committee nominates the best one for this contest. September 27, 2012 in the conference hall of the National Library of Belarus summarizing the X Republican competition of tourist «Discover Belarus». The contest was organized by the Ministry of Sports and Tourism of the Republic of Belarus, the National Tourism Agency and the newspaper "Tourism and recreation". The contest aims to promote the development of domestic and inbound tourism in Belarus to consolidate the efforts of government agencies, organizations and all those working for the benefit of the domestic tourist industry, as well as to encourage advances in the development of the tourism industry. 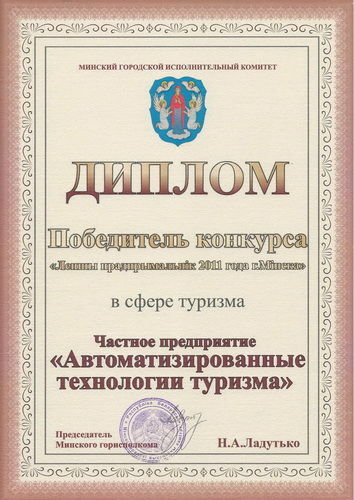 Website of the Belarusian tour operator PRPUE Automated tourism technologies was awarded in the category «For the active promotion of technologies». September 27, 2011 in Minsk, the ceremony of awarding winners of the IX Republican tourist contest «Discover Belarus» was held. The contest «Discover Belarus» helds annually since 2002. It was organized by the Ministry of Sport and Tourism and National Tourism Agency. Among the main objectives of the competition - promotion the development of domestic tourism. 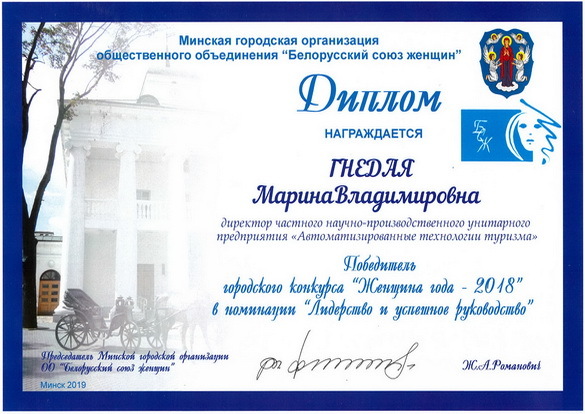 Belarusian tour operator «Automated tourism technologies» was awarded the diploma of I degree in the nomination «For the development of domestic tourism» and became the winner in the nomination «The leader in the promotion of tourism services». September 27, 2010 in Minsk, the ceremony of awarding winners of the IX Republican tourist contest «Discover Belarus» was held. The contest was organized by the Ministry of Sports and Tourism of the Republic of Belarus, the National Tourism Agency and the newspaper "Tourism and leisure". The contest aims to promote the development of domestic and inbound tourism in Belarus to consolidate the efforts of government agencies, organizations and all those working for the benefit of the domestic tourist industry, as well as to encourage advances in the development of the tourism industry. Website of the Belarusian tour operator PRPUE Automated tourism technologies was awarded in the category «The best innovative approach to tourism» . October 28, 2009 in the pavilion of the NEC «BelExpo» summarizing VII Republican tourist contest «Discover Belarus». The contest was organized by the Ministry of Sports and Tourism of the Republic of Belarus, the National Tourism Agency and the newspaper «Tourism and leisure». The contest aims to promote the development of domestic and inbound tourism in Belarus to consolidate the efforts of government agencies, organizations and all those working for the benefit of the domestic tourist industry, as well as to encourage advances in the development of the tourism industry. 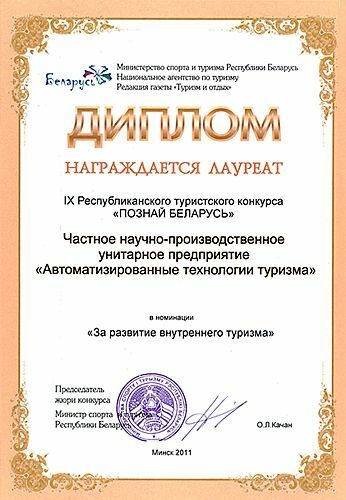 Website of the Belarusian tour operator PRPUE Automated tourism technologies was awarded in the category «For the introduction of new technologies in the service of tourists» . November 6, 2007 in the small hall of the Palace of the Republic summarizing Republican tourist contest «Discover Belarus». The contest was organized by the Ministry of Sports and Tourism of the Republic of Belarus, the National Tourism Agency and the newspaper «Tourism and leisure». 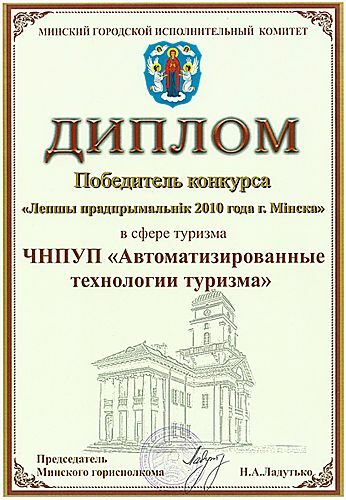 This year the competition was held on the anniversary fifth time. The contest is the main tourist competition in Belarus. 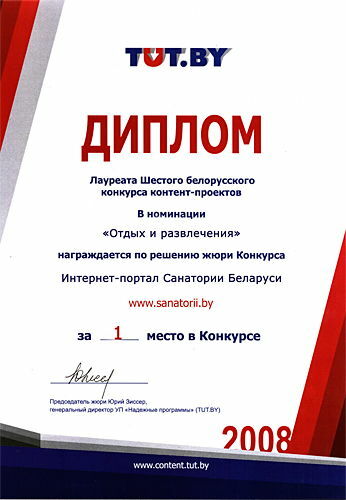 As a result of our Competition Internet portal «Health Resorts of Belarus» was awarded a special prize and a diploma «For the relevance and richness». 22 April 2009 awarding ceremony Internet Prize XVI International specialized exhibition TIBO-2009. 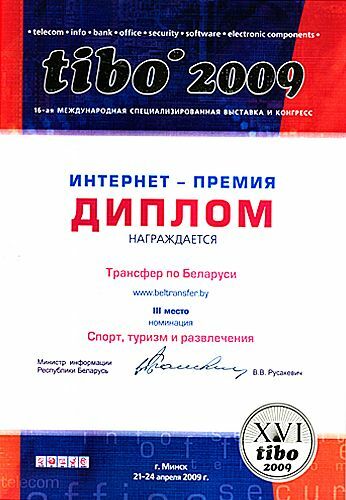 Award XVI International specialized exhibition TIBO-2009 is a professional award, awarded annually network works created in the Belarusian Internet sector, for weighty socio-cultural, technological and artistic achievements in the field of information, culture, art and education. April 24, 2008 held a ceremony awarding the Internet Prize XV International specialized exhibition TIBO-2008. 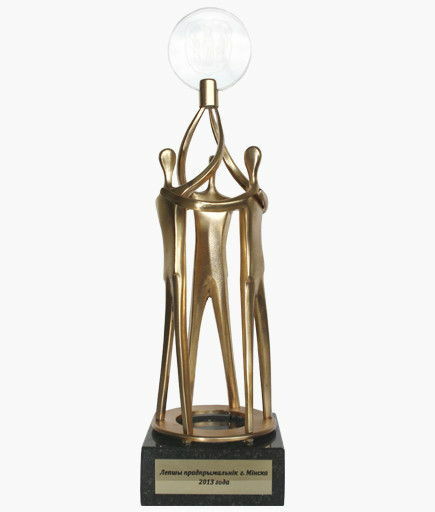 Prize XV International Specialized Exhibition TIBO-2008 is the professional award, awarded annually network works created in the Belarusian Internet sector, for weighty socio-cultural, technological and artistic achievements in the field of information, culture, art and education. As a result of our Competition Internet portal «Resorts of Belarus» took second place in the category «Sport, tourism and entertainment». April 26, 2007 held a ceremony awarding the Internet Prize XIV International specialized exhibition TIBO-2007. Prize XII International specialized exhibition TIBO-2007 is a professional prize, awarded annually to a network works created in the Belarusian Internet sector for significant socio-cultural, technological and artistic achievements in the field of information, culture, arts and education. 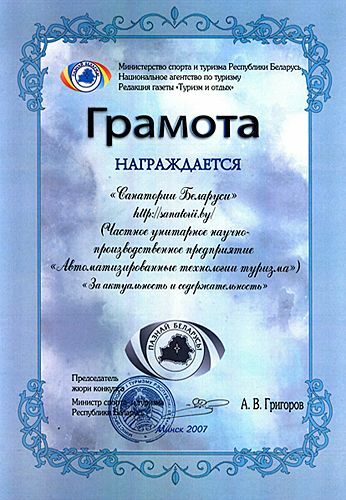 Following the contest, our Internet portal «Resorts of Belarus» became the winner of the online premium international exhibition TIBO-2007 in the category «Tourism, recreation and entertainment». April 4, 2008. in CH «Minsk» summarizing 6th Belarusian contest content projects . The competition is leading Belarusian internet portal TUT.by. 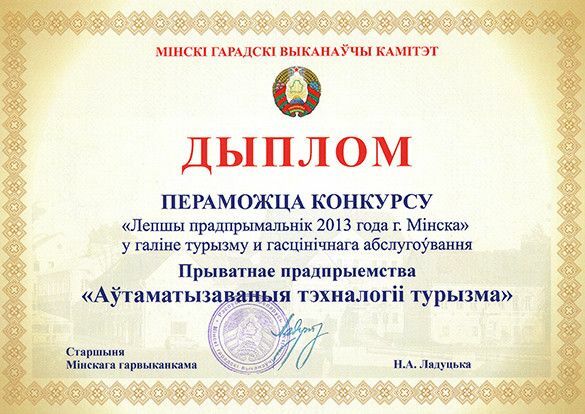 As a result of our Competition Internet portal «Resorts of Belarus» took first place in the «Activities».